We live in the Middle East where dates (and other dried fruit)are a very important and common food. Dates specifically play a big role during the holy month of Ramadan. During that time, people traditionally break their fast after sunset with three dates. Dates come in all sorts of colors, shapes and grades of sweetness. There are three main groups of dates: soft (e.g. 'Barhee', 'Halawy', 'Khadrawy', 'Medjool'), semi-dry (e.g. 'Dayri', 'Deglet Noor', 'Zahidi'), and dry (e.g. 'Thoory'). The type of fruit depends on the glucose, fructose and sucrose content. One of our neighbours got a date palm tree in her garden that is full of ripe dates. She dropped me a bag the other day, and although fresh, they tasted pretty much as sweet as dried dates. 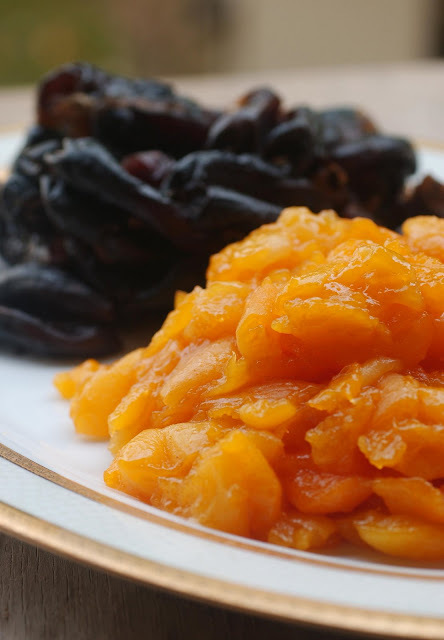 I decided to make jam out of it, combining them with dried apricots as this combination does not need any added sugar. Soak the dried apricots in the juice overnight. Cut them into smaller chunks. Bring them to boil in a heavy pot, then let simmer until soft and tender. Add the cut-up dates and blend in a food processor. Fill into jars and let cool completely. Keep refrigerated.